There are SO many books coming out (or just barely out) this Fall. So without too much fanfare here’s my top ten books to read this Fall. Linking up with The Broke and the Bookish. Unfortunately for those who aren’t familiar but really great for me a lot of these are sequels and later books in series but I am hanging on the edge of my seat waiting for them. The Crown of Midnight by Sarah Maas – I adored The Throne of Glass, adored I tell you! I can’t wait to get more of these awesome characters and unique story. It’s already out but I’m in the throws of Halloween orders so I’m waiting my turn with the library holds even though I will most likely buy it. Fire with Fire – The first book Burn for Burn was so interesting very Pretty Little Liars (TV I haven’t read the books) feeling but on a beach and with hints that there’s some supernatural powers. I cannot wait to see what comes next in this story. The Bitter Kingdom – I’ve already read it but it just came out and it’s great great great! Perfect ending to the trilogy. I am so excited for The Dream Thieves to come out tomorrow! I have been relistening to The Raven Boys this past week in anticipation. The audiobook is very well done, which is great because I can download book 2 from home in the morning! LOVED The Bitter Kingdom! And I’m excited to read Black Out, too! Glad to hear Bitter Kingdom was fab! I just started Crown of Embers this week and hope to have BK done by YALLfest. You going to that? Crown of Midnight was great. It was on of those second books in a series that I liked even more than the first one! I’m going to add How to Love and Hideous love to my to-read list! Yes to everything on your list! Awesome picks! Yo, that’s what’s up trfuuthlly. Woah, Twinmaker sounds really neat! 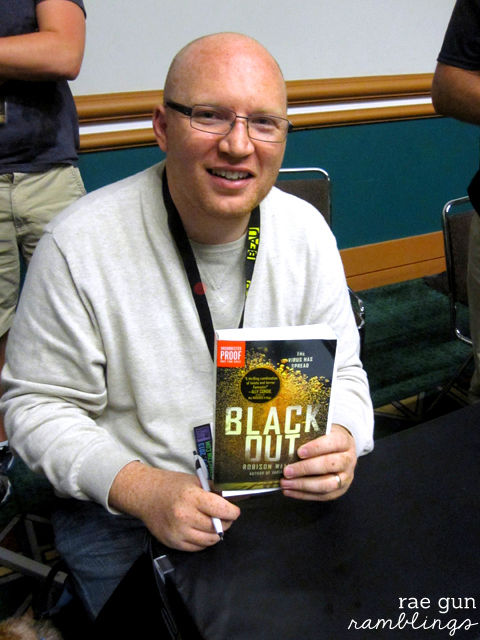 OMG, you met Robison Wells *_* I can’t wait to read Blackout. I loved his Variant series. I was kind of ehhh about NOT A DROP TO DRINK, but HOW TO LOVE was really, really good–I hope you like it! I’ve got HIDEOUS LOVE waiting on my Kindle (it sounds like it could be really interesting), and I still need to read THE RAVEN BOYS. And yes, ALLEGIANT–so excited for that one! I hope it’s as good as the others! Great list! In reading The Dream Thieves now! Honestly though Ive had some trouble getting into it. It drags a bit in the beginning I think. I still like it Im just having a hard time staying with it. Have fun reading all these books! I am glad Blackout is good so far! That’s one that I was THISCLOSE to putting on my list! I just finished NOT A DROP TO DRINK. It’s very grim, but it’s got a lot of heart, too. I loved it. Can’t wait for my copy of Not A Drop to Drink to arrive at my house. Have heard all great things about it. Hideous Love will be added to my TBR, I like the sound of that. Crown of Midnight & The Dream Thieves are really good, read those first. How to Love is our list too! Perfect. I’ve been needing some new books to read. Do you get all your books from the library or do you buy them? I hope our library has some of these awesome choices! I’m super excited for The Dream Thieves as well :). I re-read The Raven Boys last month with a friend of mine and created a playlist for it too! I can’t wait to find out more about Ronan and his family. And Yay for getting to meet Maggie Stiefvater! I wish she was coming to Toronto again this year, I would have loved to see her since I missed her last year! I’ve heard a lot about Not a Drop To Drink, I hope you enjoy it! The dream thieves has been on my list! I feel like every time I come to your blog I add books to my reading list! LOVE it! Oh I haven’t read any of these – I am so behind in reading – I sooo need to add these to my list! Thanks! I can’t wait to read Blackout. I’m also thinking about reading How to Love and I have to finish The Raven Boys before I start The Dream Thieves. I’m super excited for Allegiant and The Dream Thieves as well! I have seen How to Love on a lot of lists today. I don’t think I even know what it’s about. am going to have to look into it. I also have to read Fire With Fire soon. It’s been sitting on my shelf for a little while now. I have heard good things about it. 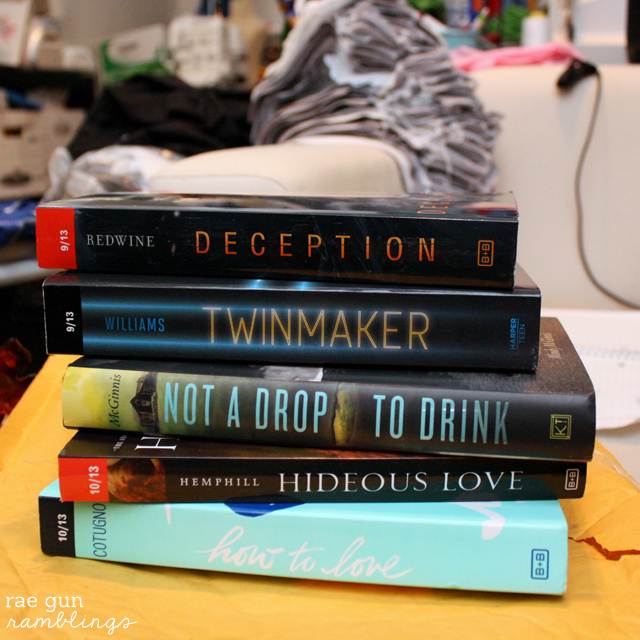 How to Love, Twinmaker, Not a Drop to Drink: all of these are on my to-read. I’ll be reading Throne of Glass and The Raven Boys this fall so yay to the sequels! I love JLA, but I still haven’t read her Covenant series. For some reason, I’m afraid I won’t like it. 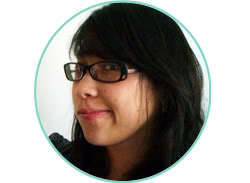 But I probably will, because it;s JLA and I’ve liked everything else she’s written that I’ve read. I’m glad I’ve found you because when I’m looking for a good book to read I never know where to go! Twinmaker and Not a drop to drip are on my wishlist! Great list! Here were my Top Ten from this past week.